On the night of October 30th, 1938, Orson Welles and the Mercury Theater on the Air presented a dramatization of the HG Wells Classic “The War of the Worlds”. Their play took the form of a series of news bulletins portraying a realistic-sounding fictional Martian invasion. Those who tuned in late missed the introduction of the play, taking them out of their fictitious context. 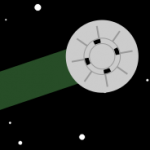 Many mistook its realistic presentation for actual reports of an imminent invasion. Whether is was thought to be Martians, or humans disguised as Martians, people believed their homes were under attack by a foreign enemy. For forty minutes Welles’ broadcast horrified the minds of his growing audience, until an intermission revealed the reality of the drama. 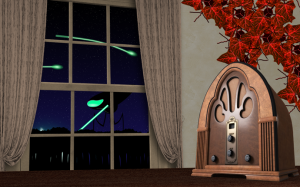 War of the Worlds Broadcast is an experiment in HTML5 Audio and Animation. It presents a recording of the actual 1938 broadcast, accompanied by visual embellishment. There are several animated scenes depicting events from the play, with more to come. 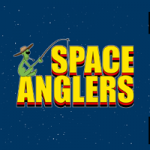 If you’re not already acquainted with the broadcast, it’s well worth your time to visit the site for the full hour-long presentation. Even if you’ve heard it already, prop up your tablet and let WaroftheWorldsBroadcast.com run in the background while you work. The Martians are right outside your house! Relive the night of October 30, 1938 and listen to the War of the Worlds Broadcast!